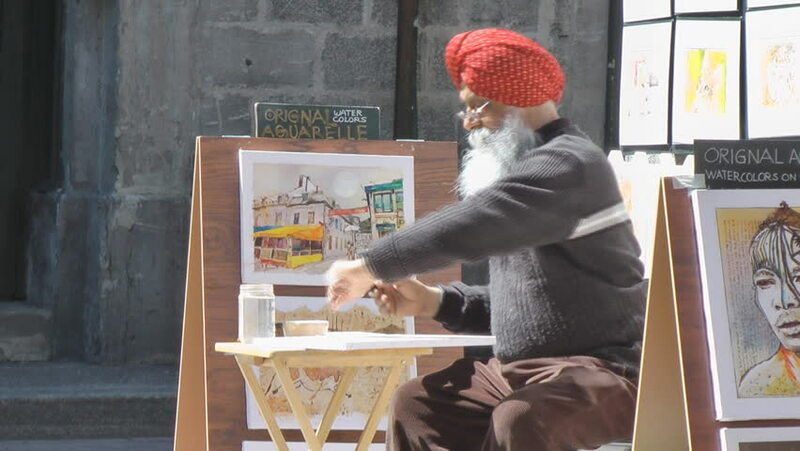 MONTREAL - MAY 2011: A mature Sikh artist sells his paintings in an outdoor artists market in Old Port Montreal. hd00:221970s: Man observes young blind girl as she paints onto paper mache puppet at crafting table. Puppets in a row. Puppet with speech bubble behind it on board. 4k00:14Young modern artist man paints a picture in the studio. hd00:13ANURADHAPURA, SRI LANKA - FEBRUARY 23, 2015: Pilgrims at Sri Maha Bodhi (sacred bodhi tree) in Anuradhapura, Sri Lanka. 4k00:20New Delhi, India - May 27, 2016: A woman is cutting watermelon in her home kitchen. hd00:18Deira, Dubai - 2010 - Wide shot of a bearded man in a white keffiyeh and black agal, in front of a shop chatting to his colleague.